What is the difference between an open and a half open file? An open file is a file on which there is no pawn. A half-open file is a file on which one pawn is placed. In the position below you see that there is one open file, the d-file and two half-open files, the e-file, on which the e-pawn is placed, and the f-file. It is Black's move so he can use the d-file to win the queen. 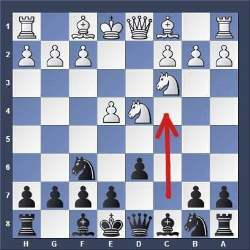 1....Bf2+ If the king captures the bishop the white queen is lost after 2.KxB QxQ. 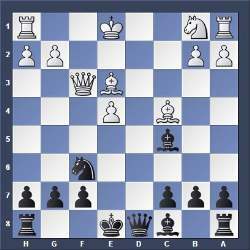 However, the queen is lost anyway after 2.Ke2 Rxe+ 3.Be3 RxB+ and the king must move away and Black captures the queen. In the example above Black has used the open file (d-file) and the half-open file (e-file) to his advantage. Control an open file immediately by placing rooks on it and/or your queen. If you hesitate the opponent can double up his rooks on the open file and will penetrate into your position with his rook or his queen. When this happens most often you lose material as the heavy pieces (rooks, queen) can attack weak pawns on the second (or seventh) rank or can attack pawns from behind in the endgame, then you might lose pawns and the game. To avoid this, never let heavy pieces penetrate along an open file into your position. Don't open a file if you are not able to control it afterwards. Keep in mind that there are no absolutes in chess as everything is relative and depends on the position. Often you have to throw common guidelines overboard because other things are more important. It is up to the player to estimate and weigh the importance of various elements in chess. For example: You might be able to get a strong attack going at the kingside, so you wouldn't waste time and ressources to protect the open file with a rook as you may need the rook at the kingside to support the attack. Sometimes you don't have to occupy an open file with your rooks because your light pieces (knights, bishops) protect the entry squares and stop rooks from entering your position along the open file, so you can use your rooks elsewhere. Or you may find that an open file is not important because it is located at the edge of the board (the a-file or h-file), which is too far away from the center. In this case it may not be worthwhile and wise to place rooks far away from where the action is, as this would draw energy away from the battlefield and you would lose center control. It all depends if the center is blocked or flexible. If the center is blocked, then you can't generate counterplay there and should control the a-file on the edge or your opponent's rooks will enter there. 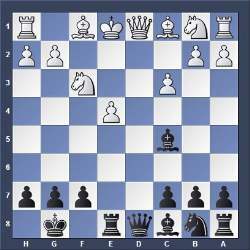 It can happen that you have a position where you don't care if the rooks of your opponent penetrate, because you have stong activity going in the center or at the kingside. In this case your opponents rooks are needed elsewhere and could get misplaced when penetrating along the open file. Many games are lost due to misplaced rooks. Below you see two open files, the d-file and the e-file. On both open files rooks are trying to penetrate into the opponents position. The f,c and a-files are half-open files. Black does not care that the white rook penetrates along the e-file to give a check because all his pawns are protected and his own rook has already a strong position in White's camp and is attacking the knight and pawns on the second rank. This will eventually win material for Black. A file is half-open when a pawn sits on it. If the pawn has the opponents color then you can use the file to apply pressure against the opponents pawn if the pawn is weak and isolated. For example: A half-open file (marked) is created in the Sicilian Defence. 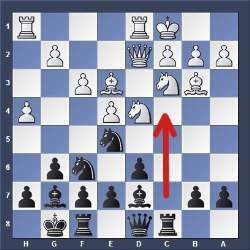 It is the c-file where Black will put his heavy pieces and apply pressure against the white c-pawn. Black will try to chase away the knight at c3. 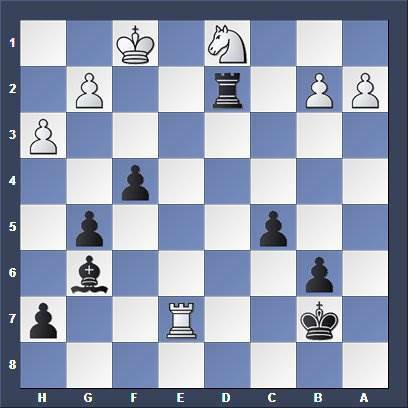 This can be done by pushing his queenside pawns ahead to attack the white knight and to open up the position to get to the white king or to win the c-pawn.